The IMPACT Conference serves as an international forum for print artists, curators, critics, collectors and suppliers of art printing materials and presses. The conference is held every second-year in August or September and is modeled on annual conferences held by the Southern Graphics Council in the United States. The first IMPACT Conference was held at the Centre for Fine Print Research at the University of West England in Bristol, England in September 1999 (http://www.cfpr.uwe.ac.uk/impact.htm). The 2001 conference (IMPACT 2) was held in Helsinki, Finland. The 2003 Conference (IMPACT 3) took place in Capetown, South Africa (www.impact2003.uct.ac.za). The conference program is conducted in English, and includes lectures, panels, technical demonstrations, exhibition, and portfolio showings. The IMPACT IV Planning Committee is comprised of Polish, German and American members. This web site serves as an organizational tool for members of the committee. CLICK HERE for the committee web section. Plans for this conference started during a Fulbright Lectureship which Beauvais Lyons held in the Fall of 2002 at the Academy of Fine Arts in Poznan. 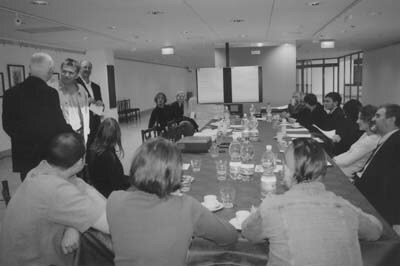 A small grant from the Goethe Institut in Krakow and funding from the University of Tennessee, Knoxville made it possible to hold planning meetings in Berlin and Poznan in the summer of 2003. A major grant from the Trust for Mutual Understanding helped to fund several planning trips and participation by four American delegates to the conference. Host institutions include the Muzeum Narodowe w Poznaniu; the Academy of Fine Arts, Poznan, the Universität der Künste Berlin; and the Druckwerkstatt, Kulturwerk of bbk Berlins. Centre for Fine Print Research at the University of West England, Bristol supported the mailing of conference postcards. Direct grant support has come from the University of North Carolina, Chapel Hill; the United States Mission to Germany; the United States Mission to Poland; the Institut für Austlandsbeziehungen e.V. ; and the Pienkow International Art Workshops. The IMPACT IV conference will serve to draw international attention to graphic arts traditions and contemporary practice in Poland and Germany. We expect around 300 or more delegates to attend the conference. In addition, a longer term goal of the conference is to foster expanded cultural and intellectual ties between Poznan and Berlin and to help foster a stronger printmaking community in the EU. Poznañ offers a superb location for the conference through the close proximity of the Fine Arts Academy, the National Museum, the Zamek Cultural Center, Arsenal Gallery and numerous galleries and restaurants located at the old square. All of these are served by a centrally located train station and numerous hotels. Speakers, sessions, exhibitions and a product fair will take place in Poznañ starting in the evening of September 7th and all-day on the September 8th and 9th. As an historical setting for both Dada and Fluxus, as well as the politically and artistically significant work of Kathé Kollwitz, Berlin offers an opportunity to consider print practice from a broad historical perspective. Berlin has a vital museum and gallery scene, including the Kupferstichkabinett (Print Museum) at the Kulturforum and the Käthe Kollwitz Museum. where we will hold an evening reception on Monday September 5th. The Druckwerkstatt (print workshop) at the Kunstamt Bethanien Kreuzberg offers a superb setting for pre-conference collaborative projects an an open house on the afternoon of Monday September 5th. Additionally, the Universität der Kunst in Berlin will be a venue for speakers, sessions, demonstrations and exhibitions on Tuesday September 6th. All of these conference venues are easily served by the efficient public transporation system. • Berlin offers an economical and convenient airline destination for many international travelers. • Berlin and Poznan are separated by an inexpensive, three-hour train ride. • The traditions of printmaking in Germany and Poland share many things in common, yet are separated by language, history and culture. • Poland has now joined the European Union, resulting in increased cultural and economic exchanges between Poland and Germany.